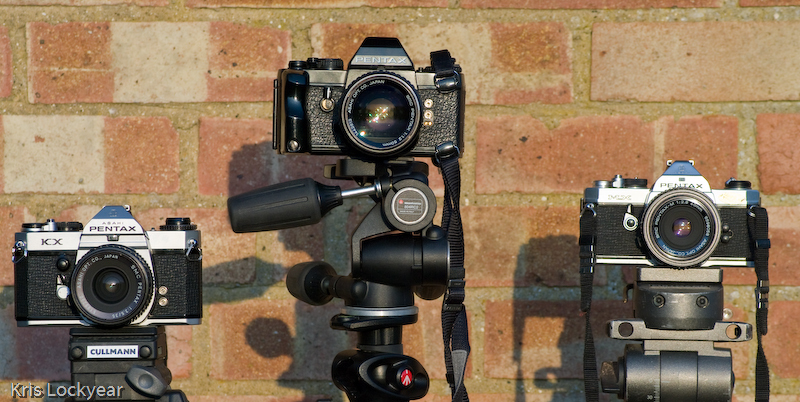 Home > Pentax User Forum > Pentax Film SLR Cameras Forum > LX - First Outing! My 'new' LX got its first trip out this morning! What a delight to use. No sign of sticky mirror, indeed, there's a good solid thump when the shutter is released. Guess I'll have to wait for the results to see if the metering is accurate and that there is no light ingress. Impressed so far though. Enjoy. It is a wonderful camera. K.
Yes Paul - enjoy it. I never had one of these, but it was obviously THE one to have - for many years! I still need to add an MX to the collection! Three X's to you too! I've seen some real beauties on eBay recently David but unfortunately the camera pot is empty at the moment! I've got four bodies for sale but nobody's biting! They're visible at http://www.jaypix.net/the-pentax-collection.html at the top of the page. Try a shot by moonlight! If you use color film the effect is otherworldly, because of the change in color temperature from daylight. With a long enough exposure you'll see smearing of shadows due to the movement of the light source; of course with metering off the film no worry about clouds briefly obstructing the moon. Do be certain your meter cells are good, since a proper exposure can be many, many minutes! A sturdy tripod is essential.